Developing world class softwares that not only meet current need but is also scalable and adaptive in a highly competitive landscape- is what we do. We pride ourselves in delivering simple solutions to complex business needs. And “Simple” doesn’t necessarily mean easy. 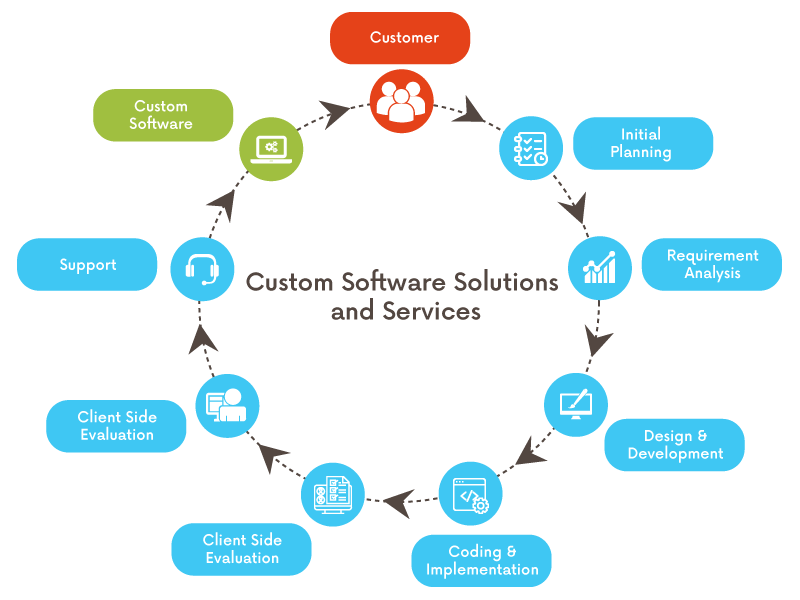 Our custom software solutions and services can be easily moulded with your software needs for your business goals from a variety of industries. We aim to deliver solutions that help businesses manage their software requirements effortlessly and simplify business management. Our custom-made Software Solutions are designed keeping in mind customers / clients requirements and adapt easily with the industry standards. This helps in managing your business and offering service excellence to your customers. A full-fledged API development service offers seamless 3rd party integrations and the ability to generate business from external sources that will get your web portal up and running in quicktime. We provide solutions that understands your business. We ensure business structure enhances easily as need arises. We aim to bring on the new and innovative technologies to automate processes. We deliver solutions that fit in the industry practices specific to your precise industry.